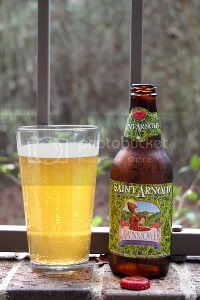 This is the second Saint Arnold offering in a series featuring my local microbrewery. Buying local beer both greatly reduces the carbon footprint of your pint and puts your dollar in the pocket of a local company. For the next beer I decided to jump to the opposite end of the spectrum. The Lovibond spectrum that is, har har. Launched in 2000, Fancy Lawnmower quickly became one of Saint Arnold's signature beers. The beer is an award-winning Kölsch, having racked up one gold and two bronze medals in the Great American Beer Festival. The ingredient list reads pale malted barley, pale wheat, German Hallertauer hops and a type of top fermenting ale yeast that happens to ferment at lager temperatures. I have to admit, even though this beer is a Houston icon, I've never tried it. Let's see how it stands up. Verdict: While Kölsch is not one of the styles of beer I usually reach for, this is certainly a beer I can enjoy. If I was outside in the heat at a ballgame, this would be an almost perfect choice.